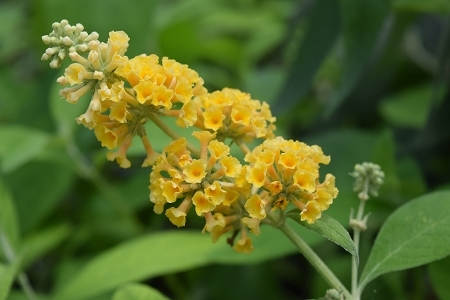 Honeycomb Butterfly Bush (Buddleja weyeriana) - Unusual yellow flowering variety. Large hardy plant features elongated gray-green leaves and large yellow flowers giving the appearance of "honeycomb", hence the name. Blooming all summer and well into the fall. This easy to grow beauty will reward you year after year with it's amazing blooms. Grows to 6' . Perennial zones 5-9. Live plant in 3 inch container. Good phone service. Plants packed and shipped timely. They arrived barely wilted with still moist soil. Great roots and substantial foliage. After 2 days inside by the patio window they look perfect! Surpassed my expectations. Can't wait until they are blooming in their new beds. We have ordered from many different online sources for plants. This company has to be one of the best! Whoever packs their plants does so with the utmost care, each individual plants pot was wrapped in plastic, covering the top of the pot so there was no spillage of soil. Also included under the plastic was a chunk of wet newspaper that kept the plant from drying out. Then each plant was carefully wrapped in newspaper and cushioned with more paper in the box. Now for the plants themselves. They are awesome! Thick, vibrant, and healthy, these are some of the best plants I have ever ordered and even rival most of the independent nurseries in my area. Wow guys, you have gained a huge plant nerd as a loyal customer. Thank you for putting so much love and care into what you do, it shows.